Why use under floor heating specialists? UKS Group help explain! Why use under floor heating specialists? Just why should you use under floor heating specialists for your next construction project? 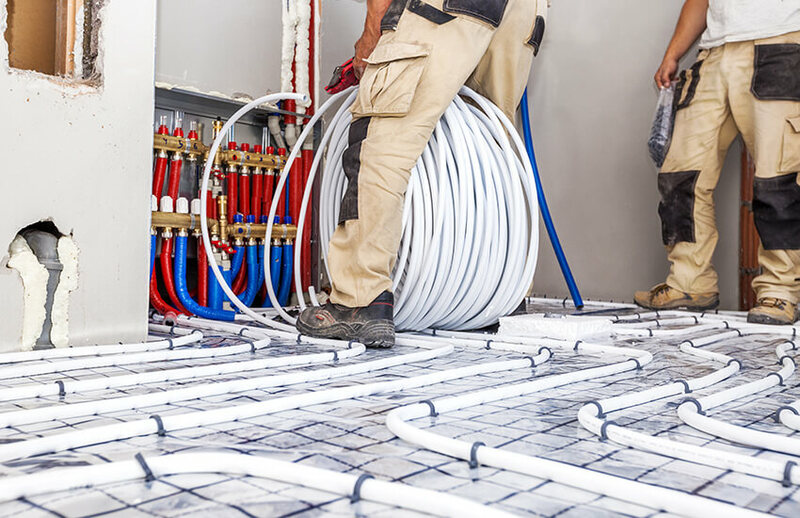 Using under floor heating specialists not only provides a low cost way to heat your latest construction project, but they also use high quality materials to ensure that you get the best possible result. However, when it comes to installing under floor heating, it’s important that you use underfloor heating specialists to ensure that the project goes as smoothly as possible. So with that in mind, in our latest blog we take a look at the reasons why you should use under floor heating specialists in more detail. Read on to find out more. Why get a specialist under floor heating company? Under floor heating is beneficial in commercial construction projects as it helps to provide greater ambient temperature control. This means that warm water is circulated through a series of looped pipes that are installed under the floor, helping to heat the premises from the floor upwards by creating a large radiant surface. However, when it comes to choosing a under floor heating company for large commercial premises, it’s important to choose under floor heating specialists that has the skills and experience to carry out the work to the highest standard. You need to make sure that your project is in the hands of the experts who know underfloor heating systems inside and out, rather than using a plumber or team of tradesmen with little knowledge of the job at hand. When it comes to choosing an underfloor heating specialist to do your project, what are the key things that you need to keep in mind? First of all, it’s important to do your research before choosing a specialist underfloor heating company by looking at reviews on websites such as Trust Pilot, Trust a Trader or by asking peers within the industry for any recommendations that they may have. This will help to ensure that you choose a company that you can trust. Secondly, when you have found a reputable underfloor heating specialist, it’s important to establish their previous skills and experience of carrying out projects such as yours and confirm that they are able to finish the work within your necessary timescales. You need to make sure that they have a reliable team of fully qualified installers who will work with you to get the job finished on time. Furthermore, an expert team are also likely to have the most up to date and modern technology to complete the project efficiently and professionally, and will also be able to troubleshoot any problems that may occur during installation. In addition, it’s also important to find out how the underfloor heating specialist plans to keep you updated throughout your construction project so that you can make sure that the work stays on track and that any issues can be rectified as soon as possible. It’s no good not being able to speak to someone when you need to, especially if something goes wrong! A Tacker System is the most widely used in construction projects as it is versatile and easy to install as a result of its versatility and ease of installation. In addition, did you know that specialist underfloor heating systems can be adapted to be more environmentally friendly? For example, they can be used with alternative and renewable energy sources including ground/air source heat pumps, biomass boilers and solar energy systems. If green credentials are an important factor for your commercial construction project, then underfloor heating is a great option to consider. Specialist underfloor heating has many key advantages for commercial construction projects. For example, as water can be made to go in reverse, the environment can also be cooled effectively in comparison to using air conditioning systems which can cause noise and draughts. Another key benefit that using underfloor heating specialists can provide is that as that there is no need to have traditional wall mounted radiators, as a construction company you will have an increased amount of freedom to design the space to ensure it completely meets your needs. Furthermore, specialist underfloor heating also is extremely effective in providing a consistent and even heat flow in comparison to wall mounted radiators too. What else do I need to know about underfloor heating specialist? It might sound surprising, but specialist underfloor heating is actually the fastest growing segment within the heating industry, partly thanks to the advantages mentioned above and due to the fact that it can easily be adapted for use across several sectors such as education, health care, and retail and residential developments. offers a host of key benefits in comparison to using one that provides traditional heating systems. Firstly, it’s possible to reduce energy use by 15%-40%, reduces air circulation and humidity by the radiant heat that is produced and also reduce the amount of airborne allergens and dust mites in the construction space too. After reading this blog, you should have a better idea of the reasons why you should use an underfloor heating specialist. And if you’re interested in using underfloor heating in your next building project, then we can help. UKS Group is the UK’s largest and most experienced underfloor heating specialist. Whatever the size of your commercial construction project, we can help. To find out more about our underfloor heating services, contact the sales team today by calling 0117 907 7298 or emailing info@uksgroup.co.uk. ← What acoustic flooring solutions are available?